Being the third most popular flowers in the world, it is very sure that you were once attracted by the beauty of the purple tulips from the local florist. Tulips are flowers that have varied styles and colors. One popular color for tulips is of course purple, the symbol of royalty. Flowers are often associated with different symbols and meanings related to human feelings. In Shakespeare’s works the purple tulips are associated with nobility. Only the color purple itself is a symbol of royalty, luxury, power…romance. They represent often choices in wedding bouquets and floral arrangements. 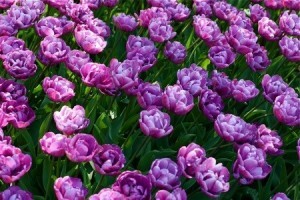 Purple tulips come in different varieties such as the Triumph, Purple Star and Claudia. These different types have different hues of purple. The different types of purple tulips do not affect their symbolism but they do affect your choices regarding the decoration of your garden. Other types of purple tulips are the Single late, Lily flowered and more. Used in combination with other colored tulips you can create an amazing exotic landscape. You can create your own garden full of purple tulips by following some important gardening advices. The most important thing is to plant the tulips during fall. Do not add any compounds at the moment of planting the bulb because this causes rotten. The dig in which you place the bulbs has to be twice as wide as the bulb itself. The winter doesn’t face a threat for the tulips as they can withstand frost. When the blooming is over the flowers of the tulip will start deadheading. A very beautiful combination to make with purple tulips is with white and yellow tulips. They create the most amazing landscape.